Dubai Welcomed 2018 The 'Year of Zayed' With Style. Dubai host an epic celebration featuring fireworks,lasers,lights to mark New Year 2018. Dubai welcomed 2018, the 'Year of Zayed', with a Guinness World Record title as hundreds of thousands of spectators were left spellbound by 'Light Up 2018', a laser light show at the Burj Khalifa. The show bagged the record for the largest laser light show on a single building. At the stroke of midnight, the world's tallest tower danced in an ethereal web of lights after paying tribute to the founding father of the UAE, the late Sheikh Zayed bin Sultan Al Nahyan. Then, the entire Downtown Dubai was turned into an art canvas as searchlights beamed artworks across buildings and skyscrapers while upbeat traditional and electro-dance music - composed by more than 80 musicians from the UAE - went in sync with the laser light spectacle. Illuminated LED facade and Laser light shows downtown at Burj Khalifa building. A burst of colours engulfed Downtown Dubai and the rich Emirati tradition was very much evident throughout the show as falcons came soaring down from the top of the Burj Khalifa. The GCC countries' flags were flashed across the tower. Light Up 2018 integrated music, visuals and acrobatic performance in a brilliantly choreographed show at the The Dubai Fountain. This was the first time the Burj Khalifa did not welcome the new year with fireworks, but the laser light show was impressive and fas cinating. 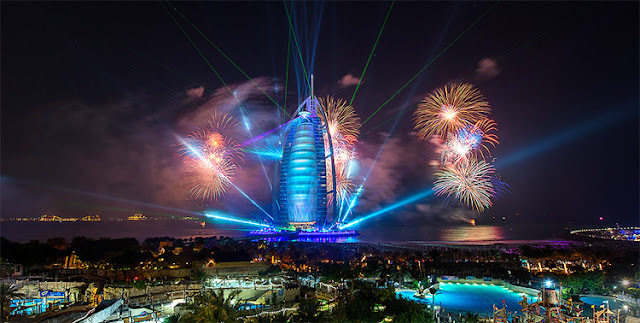 A Dubai resident of seven years, Jehan Keila Yrreverre, said the laser show was "a lot better and more enthralling than the previous fireworks displays". "It lasted longer; the show was fascinating, and furthermore, it was environment-friendly as there was no harmful smoke left after the show," Yrreverre told Khaleej Times. "The LED lights very impressive, crispier and clearer and the music really got me in the mood to welcome 2018 on a high note," he added. Greek expat Andrii Koleshmyk agreed and said he was "really impressed that Dubai is always keen on innovating". Six-year-old Arbaaz Khalid and his younger brother Bilal (2) clutched their mother's pashmina shawl and stared in awe as the night sky illuminated with a kaleidoscope of colours from the fireworks at the Global Village. The multicultural entertainment centre hosted a truly global NYE celebrations as thousands of families from over 100 nationalities got to welcome the new year seven times over! Fireworks were burst not only to welcome the new year in the UAE, but also of six other countries, through seven countdowns and fireworks displays. Families witnessed one-minute long fireworks, a world parade featuring traditional music and dance performances from across the globe, and much more. Arbaz and Bilal's mother Shainila, along with their father Khalid Shah, drove down from Sharjah to ring in the new year at Global Village. "We've witnessed celebrations everywhere else in Dubai - Burj Khalifa, Atlantis, etc and this is our first time here. It's been the best so far," said Khalid. Dubai New Year's Fireworks celebrating the New Year Eve 2018 . From whirling dervishes at the Turkish pavilion to children's dances on the main stage, from a special show by Shaolin Monks to tunes spun by DJ Nawaf, the sights and sounds at the multicultural complex reached a feverish pitch as the first fireworks show went live at 8pm. The next one happened at 9pm, celebrating Thailand; the one after at 10pm, celebrating NYE in Bangladesh; and the fireworks at 10.30pm, 11pm, 12am and 1am welcomed the new year in India, Pakistan, the UAE, and Turkey, respectively. "It is really beautiful ... I've never seen anything like it before. I really enjoyed the fact that so many cultures were able to celebrate peacefully together. The weather is perfect, and people are really well-behaved and friendly," said Shivaranjana Jadhav, an Indian tourist. The crowds cheered in unison as the pavilions of different countries got together to organise 'parades of the world'. Another Indian resident, Nissar OT, said: "There is a collective excitement in the air. It was great to see fireworks herald the new year in countries around the world. It wasn't just the nationals from these countries who were celebrating; it looked like the whole world was. The feeling of unity was truly amazing." Filipina Sheila Cabaoboa said: "I felt really happy when the fireworks began at 8pm ... I got calls from my family back home at the same time, and it felt like we were celebrating together." A packed crowd broke into shouts and whistles as spectacular fireworks lit up the sky at the iconic Burj Al Arab. The fireworks dazzled for over 10 minutes while thousands of enthralled revellers held up their phones to capture the grand sight. "The fireworks have made 2018 a year to remember. I chose to come here with my family instead of going to the Burj Khalifa as they had no fireworks tonight," said Abdullah Peconcillo, a Filipino expat, who invited his wife and son from the Philippines to spend NYE in Dubai. His wife, Geraldine, added: "I watched the fireworks for the first time and it was nothing short of amazing. My trip was worth it." Hours before the midnight celebrations, thousands of revellers grabbed their spots at the Jumeirah beach facing the iconic seven-star landmark to usher in 2018. The long stretch of sand beamed with LED lights on tents and with people clicking selfies soon after sunset. Some residents and tourists went for a swim even as the temperatures dipped. Lifeguards kept a close watch as celebrations inched closer to midnight. Despite being on a wheelchair, Rita Ruhla came all the way from Kanpur, India. "I have heard a lot about the NYE fireworks in Dubai. Even though I struggle to walk, I managed to come to Umm Suqeim beach. It's my first visit to Dubai and I want to make the most of it." Yana Wang, who set up her tent as early as 3pm, works for an IT company in China. She is in Dubai for a week to ring in the new year. "I'm having a great time here at the beach, next to nature. I prefer celebrating here rather than being indoors or at a party." The ambience at the Jumeirah Beach Residence (JBR) was infectious, with happy faces. Families could be seen out on the streets as early as 4pm, to start their new year's countdown with a view of the sunset. "We are visiting our son and his family in Dubai this year and shall celebrate the new year with a family dinner," said Samer Abboud, an octogenarian Lebanese tourist. He looked his happiest by the beach, surrounded by family and grandchildren. It was a cool, breezy evening by the beach in JBR and the weather was perfect for an evening walk. Families, with their babies in the strollers, had carried woollens for the evening's dipping temperatures. As the clock struck 6pm, the live DJ took the central promenade and started spinning international hits. Among the early arrivals were a group of 15 students from Indonesia. In Abu Dhabi for three months as part of their hospitality course, the youngsters arrived in Dubai specially to ring in the new year. "Our first stop is JBR and from here, we move to the Burj Khalifa to watch the laser light show. 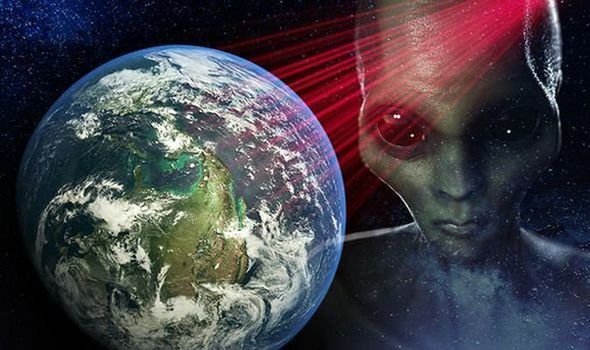 We heard they are attempting a Guinness World Record and are excited to be part of something historic," said the most enthusiastic one among them. Fireworks and celebrities heralded 2018 in the national capital. Abu Dhabi hosted international pop star Katy Perry at Yas Island and regional stars Hussain Al Jasmi, Fouad Abdul Wahid, Kadim Al Sahi and Tamer Hosni in the mainland. They raised the decibel levels of the celebrations to a full-on party mode! Katy Perry fans had a memorable night out on NYE as the pop icon, dressed in red overalls, called out to the residents to dance. "I am asking you to dance!" said Katy, setting the stage on fire with her opening song Witness. A euphoric crowd that was waiting since 7.30pm broke out into a dance as she addressed the crowd and said: "I have never played for Abu Dhabi," and then sang Hot and Cold. Elsewhere, taking the celebrations to new heights were a 15-minute fireworks display in the Corniche area, apart from those at Yas Island, Al Maryah Island and Sheikh Zayed Heritage Festival. The sky was lit with fireworks and pyrotechnic effects that infused fresh energy into thousands of residents as they welcomed 2018. There were a host of other events held at the Countdown Village at the Abu Dhabi Corniche Breakwater. 'World peace in 2018', 'Thank you UAE' and 'A new iPhone' were some of the messages posted on the Wishing Wall at the Countdown Village. Young Khalid was among the revellers. All of nine years and accompanied by his parents, he just wanted to make "more friends" in the new year. As the clock struck 12am, Sharjah's dark skies lit up with wondrous splashes of colours. Hundreds gathered at Al Majaz Waterfront, and the emirate welcomed the new year with a 10-minute fireworks display. Sharjah represented the calmer side of the country. Up until 7pm at Al Majaz Waterfront, residents and visitors were relaxing over an early dinner by the Buhaira Corniche, calmly enjoying the last sunset of the year and the chilly weather. Others were spotted taking boat rides on the lake. Emirati Ahmed Al Hammadi, a Sharjah resident, said his family would be sticking around to watch the fireworks that would ring in the new year. "There's nothing better on NYE than good food, good company and a great place to enjoy the weather," said Al Hammadi, a father of two. Farah Nada, a Dubai resident, chose Sharjah as her NYE destination. "My friends are in Sharjah and I heard about the fireworks, so thought it'd be a great change!" Nada added she would spending the night around Sharjah until the midnight fireworks. "It's good to celebrate a new year, but for me, every day is a new beginning that we should seize to work towards our goals."